Update: For those of you who missed the article, I was able to obtain it from the kind folks at Bootleg Magazine and provide it for you here in digital form. Simply click on the images after following the link to view the pages full size. 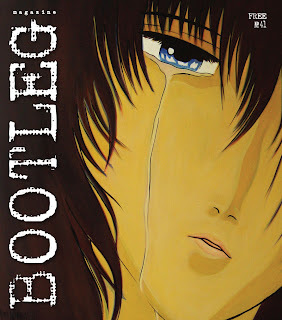 The December issue of Bootleg magazine should be of particular interest. Reason being, yours truly is the featured artist and cover story for the new issue! I'm very excited to see this, and can't wait till Monday. Bootleg magazine has been running strong for a few years now, and it gets circulation locally, regionally, as well as nationally (in select locations). A big thank you goes out to Brian, the mastermind behind the indie rag. They have consistently shined a spotlight on alternative trends in art, music, and literature; among other things. I am hoping that this added exposure will help a little with our trials and tribulations this holiday season. Bootleg magazine can be found all over town, in coffee shops, art galleries, salons, and numerous other venues. For more information just check out their MySpace page.